Jenn is a graduate from the Doctorate of Physical Therapy program at Northeastern University, after receiving her B.S.in Rehabilitation Science from Northeastern. She has clinical experience mainly in orthopedics and sports medicine, but has also worked in pediatric and geriatric settings. 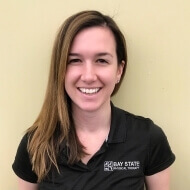 She is passionate about injury prevention and wellness, manual therapy, and helping each client reach their individual physical therapy goals and potential. She is a certified Strength and Conditioning Specialist (CSCS), a member of the American Physical Therapy Association and the International Institute of Race Medicine. Jennifer enjoys running and soccer, recently having run the NYC marathon for Team MR8. She enjoys volunteering for athletic organizations such as the Boston Athletic Association at the Boston Marathon, with Pan-Mass Challenge, and the Marine Corps Marathon.